Several months ago, my friend Rob (full name – Roberto LoRusso) decided he was going to fly from his home in Canada, with his bicycle and a whole bunch of clothes and camping gear, and meet me in Helsinki, Finland for a week-long, 650-kilometer, self-supported bicycle tour. 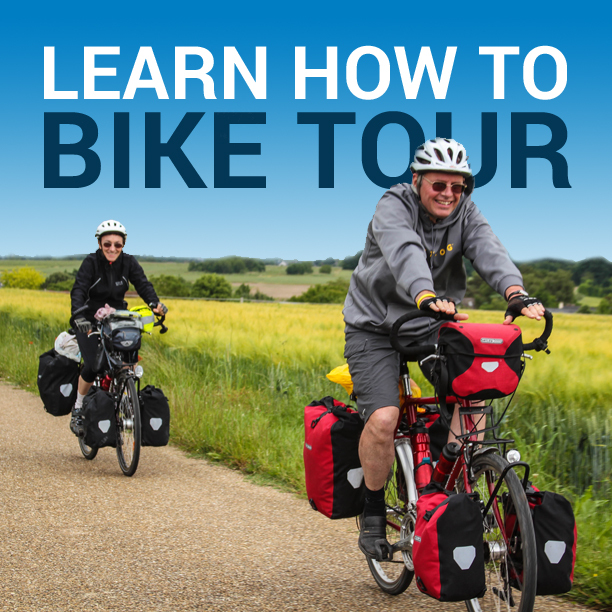 I had met Rob for the first time on a guided bicycle tour in Switzerland, and last summer we conducted a self-guided bicycle tour through France’s Loire Valley together. But this bike ride across Finland would be Rob’s first time ever conducting a self-supported bicycle tour where he would have to carry all his own gear, decide on his route each day, make his own meals, and secure lodging for himself each night. The plan from the beginning was for me to meet Rob in Helsinki, Finland after I completed my bike tour along the Danube River; my bike ride from Poznan to Gdansk; another stretch of cycling from Gdansk to Vilnius, Lithuania; a short bike ride from Vilnius to Riga, Latvia; and a two-week-long, self-guided bicycle tour through Latvia and Estonia with a company called City Bike Ltd. After I did all that, I took an expensive 42 Euro ferry boat from Tallinn, Estonia to Helsinki, Finland and met Rob in a small, studio apartment in the center of Helsinki, that we rented together from the AirBNB website. Rob arrived at the apartment just a few hours after me. We were quick to plug in our electronics and begin prepping our bicycles for their time on the road. After we got settled into out apartment, Rob and I spent some time walking around downtown Helsinki and took several photos while we were at it. After a day of rest in Helsinki, we checked out of our small studio apartment and rolled our loaded bicycles out onto the street. This is where our bicycle tour began! It took a little more than an hour to get out of the urban center of Helsinki, but once we did, we were flying! I had hoped we would be able to cover at least 80 kilometers during our first day on the road, but we ended up cycling more than 120 kilometers on that first day. I don’t know exactly how we did it – especially because we didn’t even leave the apartment in Helsinki until close to 11 AM. We cycled a lot during that first day, but we also took a few short rest breaks as well. Rob was still a bit tired from his long flight from Canada… and I was a bit tired from the past month-and-a-half of cycling in Poland, Lithuania, Latvia and Estonia. I used my smartphone to show Rob just how far I had come over the last month-and-a-half… and where I had slept each night. As we cycled, Rob and I began to quickly discover the names of Finland’s most common markets and corner stores. We learned how much things cost (a lot – but not as much as I thought it all would be) and the best way for us to combine responsibilities and travel together. Because this was Rob’s first self-supported bicycle tour, I did a lot of talking during our first day on the road. But I didn’t really need to do that much to help Rob along. He is a super-strong cyclist and was well-equipped for our bike ride together. That first night, Rob and I set up our tents in a small, deserted farm field near a lake. When the fog rolled in and it began to get dark (after 11:30 PM), we crawled inside our tents and called it a day. At the supermarket the next morning, Rob and I met a man riding a very unique motorcycle, and stopped to speak with him for a few moments before loading up our bicycles with fresh foods and a whole lot of water. We took a wrong turn at one point and ended up going down a quite forest road that ran parallel to the road we had planned on traveling. The road was smooth and covered with a thin layer of gravel, so it made for some good cycling. We even stopped at a large lake along the way and had lunch while dark clouds formed overhead and threatened us with rain for just a few minutes. Amazingly, we did not experience more than 60-seconds worth of rain on our entire bike tour. The weather was perfect. It was about 80+ degrees F most days… and about 55 F at night. Our second campsite was my personal favorite. It was just outside the city of Joutsa, Finland – in a sandy area that was perfect for mosquito-free camping. I found two cans of white beans at the local supermarket, so with no camp-stove, cook pot, or plates of any kind, I cooked up some of the best damn mean and veggie burritos I have had in months. Good Mexican food is difficult (maybe even impossible) to find in Europe. I haven’t found good Mexican food yet! In Joutsa the next morning, Rob and I refilled our water bottles and food supply before once again hitting the road. While Rob was in the supermarket and I was waiting outside with the bicycles, I snapped this funny photo of a man on a motorcycle feeding ice cream to a tiny dog. I was afraid that cycling across Finland might be a bit boring – just because there are so many forests. But I found Finland to be much more scenic than I thought it would be. Rob kept saying that the scenery reminded him of where he is from in Ontario, Canada… and I believe him. But I was very pleased with just how much there was to look at and explore along the way each day. At one point during our third day on the road, we climbed to the top of a small hill… and from the top we had a pretty spectacular view of the lakes and forests below. I climbed up to the top of a metal street sign in order to snap this photo of Rob on his bicycle. And just a short ways further down the road, we stumbled across hundreds of small sailboats and people out enjoying the incredible summer weather. We stopped on the bridge that crossed at Karkistensalmi and spent several minutes snapping photos and watching the sailboats below. It wasn’t long after leaving the sailboats behind that my front derailleur cable snapped and I was unable to switch gears. This was a major problem, but we thought we might be able to find a new cable in the next town – Jyvaskyla, Finland. Unfortunately, we arrived in Jyvaskyla just after 5 PM and all the city’s bicycle shops were closed. We considered staying in town until morning, at which time I might be able to purchase a new derailleur cable. But it was a Saturday, and the following day was a Sunday. And every bike shop in town was closed on Sunday. So we needed to find a new derailleur cable right away! After more than an hour of running around town trying to find someone who could help us, we eventually stumbled across a bicycle graveyard of sorts, where old bicycles had been stacked up for recycling. Rob and I were able to cut a cable off one of the old bicycles and continue on our way. By this time it was getting late and we still had a ways to cycle for the day, so I put the cable in my pocket and planned on installing it the following morning. Then, an hour or so later, just as it was about to get dark, Rob and I rolled off the main road and pitched our tents in a dark, dense forest. There were a ton of ants and mosquitoes at this particular campsite, so Rob and I set up our separate tents as quick as we possibly could and jumped inside. Once inside, we pretty much remained there until morning. I woke up before Rob the next morning (I think this was the only time on the tour that this happened), so I quickly packed up my tent, gear and bicycle and made my way out to the main road. I found a parking pull-out and stopped there to repair the broken derailleur cable on my bicycle. The repair was easy to make and only took me about 20 minutes to complete. I could shift gears again! A short while after fixing my cable, Rob met me at the parking pull-out and we sat at a picnic table to eat breakfast. This was when Rob discovered that a jar of cooking oil he was carrying in one of his panniers had burst open and had soaked his clothes, shoes, and a bunch of other personal items. So Rob took some time to clean all his gear, and just as he finished that, Rob realized that he had a flat tire on his bicycle! Rob then tried to repair his flat tube, but in doing so, tore a hole in the side of tire. We were not off to a good start for the day! Luckily, Rob was carrying a spare tire and three spare tubes. So Rob was eventually able to repair the damage to his bicycle and we were finally on our way. Finally! It was nearly 12 PM by the time we got started that day… and we knew we had a long way to go. So we put our heads down and we cycled. I listened to music and RadioLab podcasts while I cycled each day. Rob usually rode a short distance behind me, but would occasionally take the lead and demonstrate to me over and over again just how much faster he is than me on his bicycle. I couldn’t keep up with him! Somewhere along our route that day we stopped in a tiny lakeside town for lunch, and after spotting a deserted swimming hole, we both decided to jump in and take a quick bath. After three full days without a proper washing, it felt great to jump into that cold water. In the city of Viitasaari, Finland, Rob and I stopped to eat pizza at a local pizza restaurant. Rob loved the pizza he ordered and I thought my vegetarian pie was too thin and terribly undercooked. But it filled us both up. Unfortunately, it filled up Rob a bit too much. After cycling about 3 kilometers out of town, we had to turn back and find a restroom for Rob to use right away. A corner gas station did the trick… and we were soon on our way again. We didn’t get far outside of Viitasaari before we found a place in the forest to set up our tents for the night. It was a warm night, with plenty of mosquitoes swarming around our campsite, so we set up our tents quickly and then spent the evening on our smartphones and/or talking back and forth to one another between our tents. When I asked Rob to pose for a photo, he refused to get out of his tent (where the mosquitoes would bite him), so for just a split second he stuck his head out of the zipper… and I snapped this pic. Haha! After having completed four days of cycling, we were well ahead of schedule, but we still had over 200 kilometers to go before reaching Kajaani, Finland, where Rob’s bike tour would eventually come to an end. So on our fifth day of cycling together, Rob and I covered more than 130 kilometers. Luckily, the weather was great, the road was flat, and the wind was mostly on our side. I powered myself through the bike tour with ice cream, granola, yogurt, oranges, bananas and the occasional veggie sandwiche. Then, during our last night of camping, we pitched our tents about 150 meters off the road, in a dry forest area where everything was covered in a thick layer of moss. With few mosquitoes in the area, Rob and I both enjoyed this campground quite a bit. While Rob and I were traveling together, we were both using different solar products to keep our smartphones charged. The photo below shows my Voltaic Fuse 6 Watt Solar Charger hanging from a tree. This charger usually sits, bungee corded to the rear rack of my bicycle when I am cycling each day. But when I reach camp each night I usually hang it up or lean it against my tent in an attempt to get just a little more juice out of the available sunlight. During our last day of cycling together in Finland, Rob and I cycled a short 90 kilometers into the city of Kajaani, Finland. Like our previous 5 days on the road, the weather was wonderful, the road was flat, and we were enjoying ourselves. It was hot… and somewhere along the way, I jumped into a lake to cool off. When we reached Kajaani, we went straight to the train station to buy Rob a ticket for him and his bicycle back to Helsinki. Once his ticket was secured, we then went to a nearby hotel and booked ourselves a room for the night – 78 Euros. Ouch! But it sure was nice to be able to shave, take a shower, and sleep in a comfortable bed. To celebrate the end of our bike ride together, Rob and I went out to eat dinner at a local cafe/restaurant. Rob ordered salmon and I bought a 16 Euro veggie burger, which came with an avocado/pineapple salad (which was really good), and the best sweet-potato fries I have ever had. The actually veggie burger was really gross. It was almost entirely tofu… and I hate tofu. Before going back to our hotel, Rob and I took one last photo together on the edge of the lake in Kajaani, Finland. Our bicycle tour was a success and we both finished the tour safely and in good spirits. Stay tuned for the next installment of my bicycle touring adventures in Finland. 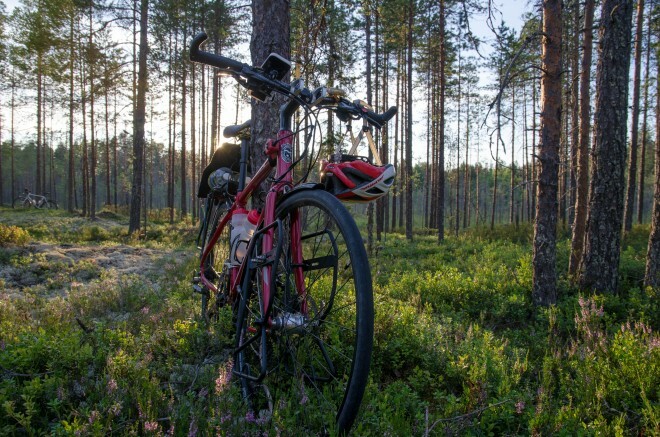 In just a few days I’ll be conducting a 4-night self-guided bicycle tour across a small section of Finland with a local tour company called Upitrek. This entry was posted in Bicycle Touring Pro Articles, Darren Alff's Bike Tour Blog, Europe, Finland, Locations, Photos and tagged blog about findland, cycling across finland, cycling in finland, darren alff and roberto lorusso, europe and finland, findland, finland bike tour, finland cycling routes, finland travel blog, first bicycle tour blog, first bike tour, rob, rob's bike tour, roberto lorusso, self-supported bicycle touring, traveling in finland. Darren I enjoy your blog and posts but I am disappointed in the fact you often do not where you helmet. I think this is not appropriate for a “pro”. Dan, have you ever been to Europe? Hardly anyone here wears a helmet? If it makes you feel any better, I usually just take my helmet off for the photos. See the ice cream photo above. My helmet is on! This is how I ride most of the time. You can ask Rob. haha. But when I’m being photographed, I take the helmet off because I hate the way I look in a helmet. Helmets are not obligatory in Europe. I had to weare a helmet in Australia, hate those things! Will you cross now the Baltic to Sweden? Mosquito’s. Try to find an open spot at the water (lake): less mosquito’s. In the forest they are abundant ( is my experience). Darren, I love your site and have been able to glean much information from it. Thank you for providing such an excellent resource! It is nice to hear how you meet up with different people to travel with and the good times you have in their company. I look forward to your next instalment. Keep up the great work! I try to get to Finland every year for a month, and over the last 30+ years have logged thousands of miles in the Nordic countries (all but mountainous Norway). This year my trip to Finland was mid-May to mid-June and I covered about 1500km, last year it was only about 1200km. Finland is a wonderful, safe touring destination amongst a bicycling society. I travel with no itinerary but just wander randomly. Helmets are required in Finland, but there is no penalty if you don’t wear one…I always do. I typically try for the east and west borders and always spend time in the south region. I agree that it seems hard to get out of Helsinki; however if you know the paths, bikeways, etc. there are beautifully scenic routes as you go north from downtown Helsinki. This year I focused on the archipelago at the southwest where all ferries are free. Did you mention “Everyman’s Right” to camp most anywhere as long as you do no harm? This is true in all the Nordic countries. Finland is unique and well worth some research before you go. A university education at all levels is free for anyone from any country as long as you pass the entry test and they have a spot…..just one of the unique things about travelling in an ‘advanced’ egalitarian, well educated country full of satisfied people…. Cute story well written as usual but didn’t seem to have a lot of point to it nor highlights. Nice scenery though. Just my thoughts. Anyway I was keenly interested in your partners (Rob) bike. I couldn’t work out the name and model other than a flat bar roadie with disc brakes. Can you please enlighten. My SO and I just completed a two-day tour from Jyväskylä to Helsinki a week ago and had a few questions / thoughts. From the map you posted it looks like you guys mainly followed the big roads. Wasn’t it intimidating with all the traffic and also rather boring due to their utilitarian nature? If you’re considering a tour in central Finland and don’t mind some hills you should take the smaller roads along the lakes after Lahti. Some exquisite scenery and lovely little villages to stop in! Also I was wondering about whether you got to see and do anything else in Finland apart from the cycling. When you bike for a 100 km every day I wouldn’t think you’ve the energy for anything else. My compliments, Darren. Interesting tour and well described what you went through. About the cooking oil in the clothes: My partner and I always keep any liquid seperate from clothes or camping gear. Either outside our bags, attached to the bike frame (tank with gasoline, beer, water), or in the pannier with only kitchen tools + pans. The derailleur cable of Rob: Are spare parts like cables and spokes not a basic bike equipment for his long trips? Mosquito’s: always camp out far from woods, if possible. Mosquito’s love woods and no wind..!